A consensus is not the only way to successfully build products. A compromise is even worse. Sometimes, you need to "disagree and commit." Why should you use "disagree and commit"? Faster decision making. No endless discussions. Even if you disagree you take a decision and move forward. Clear accountability. You know exactly who is responsible so it helps with moving forward and keeping track. Team spirit. Despite the disagreement that always could happen a team works together and committed to reach their goal. 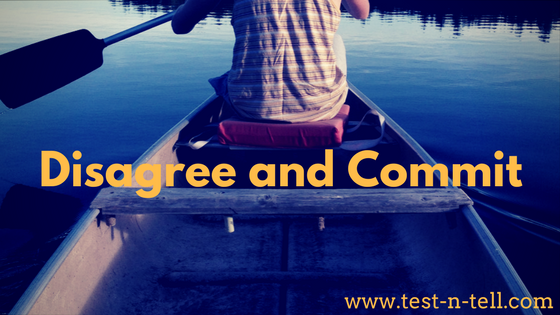 What do you need to use "disagree and commit"? Trust. You need to trust your peers or subordinates to do their job even if you disagree. Accept failure. It will happen. You can't only make the right decisions. Most important is what you learn from a failure and how it helps you to move forward. What if you don't "disagree and commit"? You might disagree with this approach but what stops you from committing to it, even if briefly, to test and tell if it works for you?